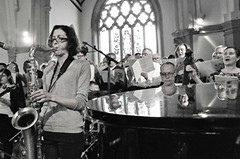 Vox Holloway is holding a third all-day singing workshop, to take place on Sat 17 January 2015. 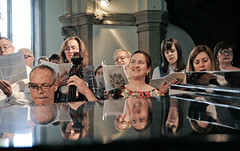 The day will comprise 3 workshops on singing by ear, choral techniques and musical tips for sight-reading. You can explore your voice, improve your singing, get to know members of your local community and most importantly have lots of fun, as the video of our first workshop shows below. When: Saturday 17 January 2015, 10am – 6pm. Price: £20 (includes a buffet lunch – please let us know of any special dietary requirements). Bursaries are available for anyone short of funds. Tickets: Available via Eventbrite and are likely to be available on the door. 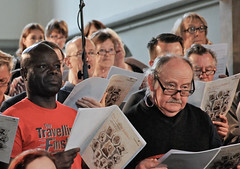 Who can attend: The workshop is open to anyone 16 years and over – you don’t have to be a member of Vox Holloway – and we welcome singers of all abilities: both those new to singing and more experienced singers. Questions? Contact us via the form on the right. 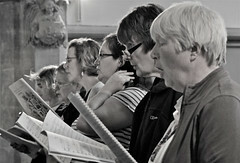 This entry was posted in Community choir, Singing, Workshop and tagged choir, singing workshop. Bookmark the permalink.